Today I thought I would show you how I turned a basic metal crate (bought at a yard sale) into a pretty and functional storage container. I've had the metal crate for a while and just never really used it for anything. The other day I saw this purse in Country Living (April '11) and it inspired me to create a liner for the crate with lettering on it. To start, I sewed a very basic liner using a cloth laundry basket liner that had torn a few months ago and wasn't usable. I almost threw it away, but decided to save it in case I could use the fabric sometime, and I'm so glad I did! Note to self: Never throw anything away! To make the lettering on the cloth liner, I printed out the wording I wanted to use onto regular paper. Then transfered it onto the liner using carbon paper. I buy carbon paper at a small educational book store (if you're local, it's Ken's Educational Joys). You could also use graphic paper which is pretty much the same thing, and I've found it at craft stores (Flower & Craft Warehouse in Blue Ball). I filled in the lettering with a gray paint pen. Paint pens are SO handy to use and are much more precise than using a brush. Love them! If I have to wash the liner, I'm not sure how the paint will hold up, but I doubt I'll need to wash it often, so I'm not worried about it. I wanted it to look a little bit faded, so I didn't make the lettering very dark. 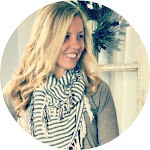 Linking up to Making the World Cuter's linky party. I love that basket what a great find, and using the paint pen is a great idea! Very cute! I love baskets with liners! This is adorable! It's perfect - what a great idea!